The Fringe Binge in December was such a success, it has returned in 2012. Except this time, instead of watching 65 episodes, the total number of binge episodes will decide on which episodes Fringe fans vote for. See below and save the dates! VOTE for the Fringe episodes you want to see during the FRINGE BINGE MINI MARATHON! That’s right, by popular demand, FRINGE BINGE will return from Friday, March 2 through Sunday, March 4 - a worldwide simultaneous home rewatch of YOUR favorite episodes! We had so much fun over the holidays watching all episodes of FRINGE, that we can’t wait to do it again! We’ve tentatively scheduled the next marathon event for the first spring hiatus weekend after February sweeps. This time, we’ll be re-watching viewer’s choice of episodes from Season 1, 2, 3 and 4. The whole idea is to just have a simultaneous worldwide FRINGE-a-thon where we’re more or less watching the same episodes in the same order at the exact same moment across all time zones. During the marathon, we’ll also live tweet and check in on GetGlue too! 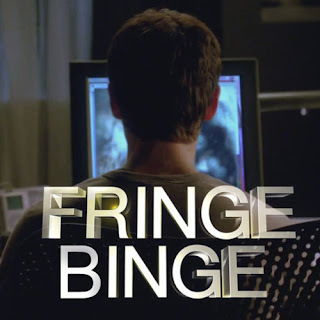 What Fringe episodes do you want to re-watch? VOTE NOW!